Florida Gators football rolls into its first road game on the strength of its defense. Down a key starter in the most hyped game of its season, Florida will need to put all its offseason preparation together for an exceedingly tough test on Saturday afternoon. Here’s what you need to know and how you can watch Florida-Tennessee. 1. The Gators are standing tall: The top storyline entering Saturday is obviously Florida’s 11-game winning streak. Unlike past years though, the Gators are not shying away from it nor how badly they want it to continue. Florida junior cornerback Jalen Tabor has been talking trash about this game all offseason, and his teammates have rallied behind him as the Gators now look to cash the checks their mouths are cashing in Knoxville. Though one might think this means there’s more pressure on the visitors, it’s really the Vols that once again have everything to lose in this game. 2. This game could be even better: Florida is missing three starters at quarterback, right guard and wide receiver. Tennessee is without its starting linebacker — along with a reserve ‘backer who would have stepped in — and one of the best cornerbacks in the nation. Neither of these teams is the walking wounded per se, but a competitive game could have been even more so if the Gators and Vols were at full strength. Plus, it would have eliminated any potential excuses for either side. 3. Where’s the offense going to come from? 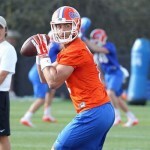 With redshirt sophomore quarterback Luke Del Rio out, Florida needs to find a way to put some points on the scoreboard. The Gators defense grabbing a couple turnovers or helping the team maintain great field position will go a long way to that end, but the visitors must also find a way to move the ball efficiently. Graduate transfer Austin Appleby primary task should be ball security. Florida should be a run-first team. But if Tennessee has success topping that early, well, the Gators better have some tricks up their sleeves. 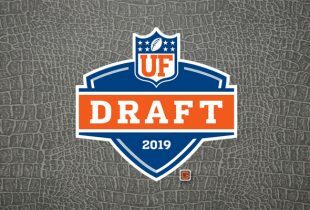 As soon as the spread came out on Monday at +8.5, I made it very clear that the pick was the Gators. Considering that the line was as high as 10-11 in weeks prior to the game, you could have gotten an even greater value. Now sitting at +5, you’re paying for having waited. But here’s the thing: It doesn’t matter. The points are nice to have in your back pocket Saturday, so you should certainly take them because this game will be close. But while you’re at it, you might as well grab Florida at +175 straight up, because the Gators are going to win this game. Del Rio being out certainly made me think twice about this week’s pick, but ultimately I have to rely on my eyes. And here’s what my eyes have told me from watching all three Florida games and most of Tennessee’s three games: The Gators are better. Florida’s defensive line should terrorize Tennessee. As long as the Gators can maintain their rushing lanes and ensure Joshua Dobbs doesn’t take off like he did a year ago, they should be just fine. If they can do that, they will be forcing Dobbs to beat the best secondary in the nation with his arm, and Dobbs has yet to go a game without throwing a pick this season despite playing Appalachian State and Ohio. Dobbs ran all over Florida in 2015 (136 yards rushing, 58 yards receiving and a touchdown), but he also completed 10-of-17 passes for 83 yards. Florida’s offense will be an issue, of course, but it’s facing a Tennessee team that gave up 13 to Appalachian State, 24 to Virginia Tech (which lost the ball via fumble on five possessions) and 19 to Ohio. No matter what kinks are being thrown into UF’s game plan, McElwain likely stressed just one thing this week: Take care of the football. Can the Gators figure out a way to post 20 points (two touchdowns, two field goals) on Saturday? You bet they can. And even if they don’t, can the Vols get to that number against this defense? That makes it clear: Florida and the under. » Florida 42-4 in the month of September since 2005. » The Gators are looking to extend an 11-game winning streak against the Vols, which dates back to 2005 and is the longest streak in series history. » Florida has outscored Tennessee 319-179 in its 11 consecutive wins, earning victories in those games by an average of 12.7 points. However, UF has only defeated UT by one point in each of the teams’ last two meetings. » The Gators are 26-19 all-time against the Vols dating back to 1916 but hold a 24-6 record since 1976. » Florida and Tennessee will play on CBS for the 19th time in the last 21 seasons. It will be the 10th time the game will kick off at 3:30 p.m. in that span. » The Gators and Vols opened the SEC schedule against each other nearly every season since 1996. The teams were each other’s second SEC opponent in 2012, 2015 and this season, third in 2014. » UF and UT are facing each other as ranked opponents for just the second time since 2007, first since 2012. » Florida’s defense has been a hallmark of the program; UF is now 207-11 since 1990 when an opponent scores 21 points or fewer in a contest, including 12-0 under McElwain. » The Gators have only surrendered 14 points through three games, their lowest total in that span since 1966. » Also under McElwain, UF is 12-0 against unranked opponents and 1-4 against ranked opponents. The Gators are 11-0 when outrushing an opponent and 10-0 when leading at half. » The Gators owns the nation’s longest streak of returning either a kickoff or punt for a touchdown, doing so in 11 straight seasons. They has yet to accomplish that in 2016. » UF has the second-most wins in the nation since 1990 (252). » Florida will be making its 37th appearance on ESPN’s College GameDay, the most in the nation. 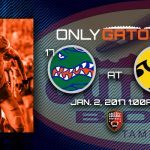 The Gators have hosted GameDay 12 times and appeared as a guest 24 times (16-8). 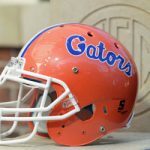 Florida will wear white jerseys, white pants and white helmets on Saturday. The team captains, which change weekly, are responsible for choosing the uniforms ahead of each game. Exactly my analysis of the game as well. Stay in your lanes. Hell play base defense for most of the game. Pound the ball. Tenn rush defense has been awful so far this year. UF doesn’t turn it over and we win by 2 TDs Great game preview! I concur. The only part of the analysis that I’m missing is whether you think Hurd will have any impact. Did your eyes tell you that the TN O line is worse then last year and that against our front 6 or 7 it wouldn’t be able to give Hurd running room?